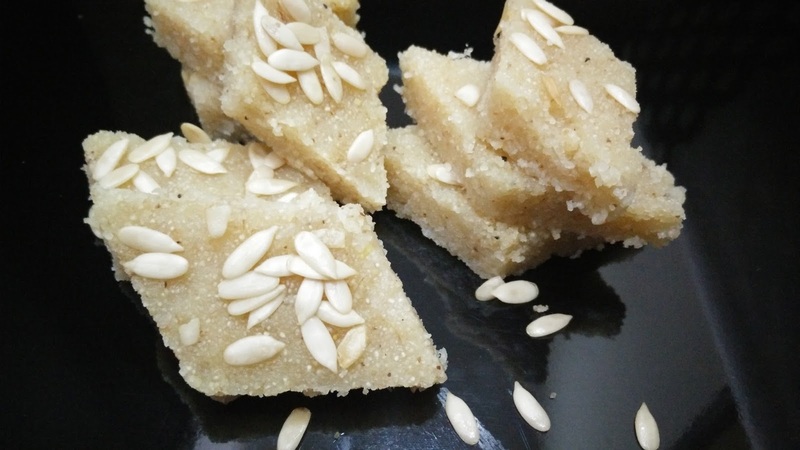 Barfi is an authentic Indian dessert which is served on every occasion. I tried this very easy to cook semolina barfi which can be stored for long unlike the khoya burfi. Heat ghee in a Kadai or non stick pan, and roast semolina in it till it turns light brown. Add milk, sugar and saffron. Cook the mixture till it dries up. Grease a flat plate with ghee and spread the barfi mixture. Thickness of the barfi can vary. Garnish with melon seeds. Take a flat small plate and move it all over the top surface to give glazing. Keep this in refrigerator for 10 min. Once set, cut the desired shape of the barfi and serve.